Ginger plants are members of the Zingiberaceae family with more than 1,300 species native to various tropical areas worldwide. Ginger is often grown as ornamental plants in gardens and along borders with its green foliage and colorful blooms. It is also grown for culinary purposes. 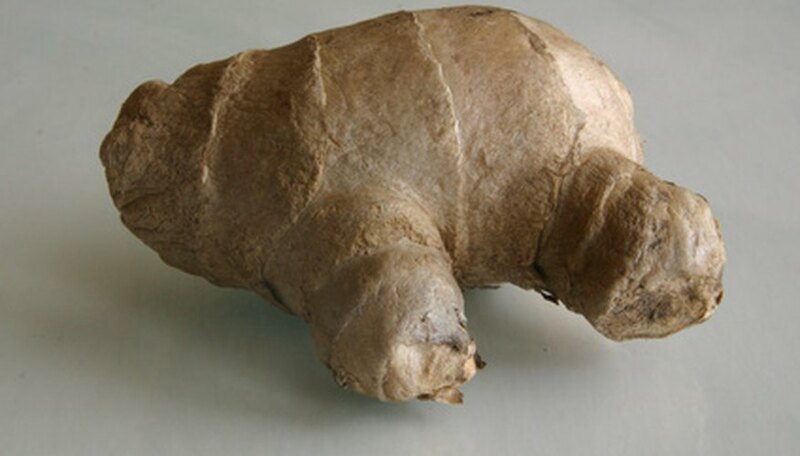 The flavorful roots found most often in grocery stores are from the variety Zingiber officinale. Ginger can be planted outdoors or in containers and, with proper care, will thrive. Keep the soil where ginger is planted moist, but not soggy from spring until fall. Watering ginger one to two times a week with an inch of water will usually suffice. If the ginger is in a container, water until the water drains out the bottom and discard any extra water that accumulates in the drainage container. Fertilizer container-grown ginger only. Use an all-purpose houseplant fertilizer and read the dosing instructions on the label. Repeat monthly. Water immediately after fertilizing. Relocate ginger out of full sun and into partial shade if its leaves are yellowing. If ginger is planted in the garden, plant a tall plant, such as an ornamental grass, about 2 to 4 feet away on the northwest side of the ginger plant. Move potted ginger indoors to a sunny location before the first frost in USDA zones 8 and colder. In zones 9 and warmer, you can keep container ginger plants outdoors. Protect garden gingers in zones 8 and colder during the winter months. If you have a garden ginger in zone 8, lay approximately 2 to 3 inches of mulch, such as leaf mold, grass clippings or bark mulch, around the base of the plant to keep it warm. In colder zones, gently dig up the rhizomes after the first fall frost and store them covered in pine bark mulch in an area, like a garage, that is around 55 degrees F. Plant again in the spring after the last frost.